in 10th Amendment, 1st & 2nd Ammendment -THE WHITE HOUSE, 2016 Election, CORRUPTION! realclearpolitics.com has been fairly accurate throughout the primary season of 2016, so I picked their poll to make a point. 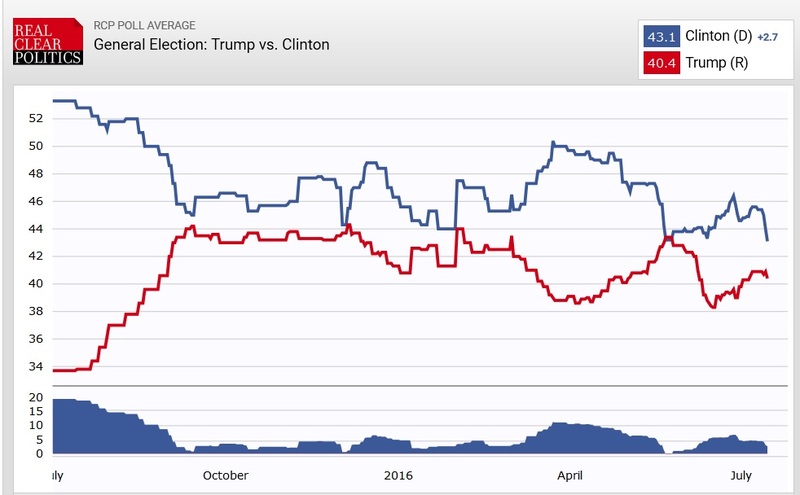 The graph’s are from (left to right) July of 2015 – July 2016, notice Trump in the 34% range, & #Killary in the 52% range, July 2015, now in July 2016, Trump @ 40% range >>>> #Killary in 44% range. There fore Trump is 6% up trend, >>>>> #Killary is (neg) -12 % down trend. Recently, the NY Post reported >>> http://nyp.st/1XOTxrR via @nypost that #Killary is down among independent voters, more recently plummeted even further. The media is trying to spin the #facts, no surprise there, in an effort to persuade you into believing she is up, the truth is she appears to be ahead by almost margin of error of Trump, yet #Killary is far from beating President Trump, she is in fact in a 365 day down trend. #Killary must be concerned that she is so far down from where she was last July, all before her first debate with President Trump. The reason among many btw, #Cruz Lost primarily, is because of the staunch right wing agenda, one world order, the far right. America is not going to vote in a staunch Conservative who doesn’t know how to communicate with the left. Ronald Reagan became one of the most successful President’s, who was a former liberal Democrat, because it gave him the ability to communicate with the left. Trump is that man today, he is a communicator, more importantly, a brilliant negotiator, who will fulfill the founders vision, move Govt, and it’s social policies, further away from the people, there by strengthening our 1st & 2nd, & 10th Amendment rights. McCain, like Romney, like Cruz want to socialize the country with religious practices, taking us back to the Old Testament, as Killary, Bubba, and Obama want to do the same socializing America, only in the opposite direction, stripping our religious rights away. America needs to wake up, otherwise we will find ourselves right back to the way things were before the founders drove us to independence. We have to many laws, to many politicians with their hands in the till, and unfortunately to many stupid Americans with their blinders on. 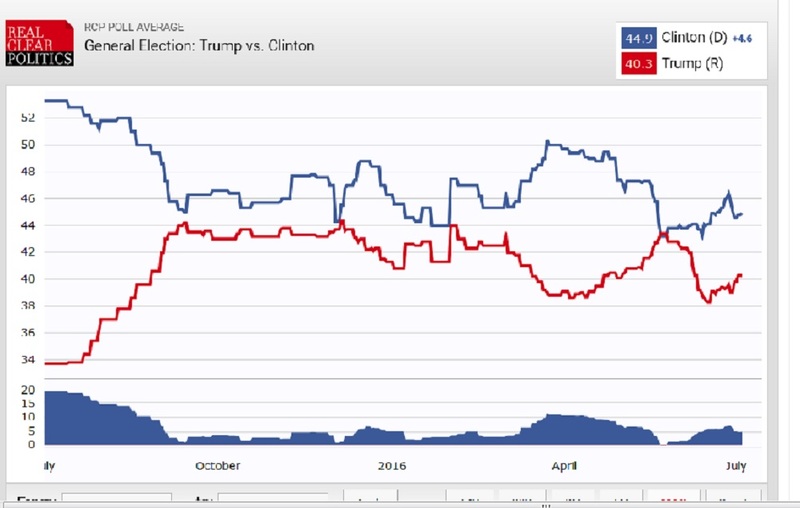 As you can see the above the sequence of polls showing how Trump has always been in an uptrend, and #Killary has always been in a down trend. I believe the latest poll – July 28th 2016 is reflecting both the inspiring GOP Trump Convention, and the latest news on the DNC road map to destroy Bernie Sanders, and #Killary slipping through the FBI’s fingers on the e-mail scandal. Not to mention her dismal DNC convention, #Killary will not be #POTUS, not by a long shot, numbers don’t lie! This one wants to push NEW GUN CONTROL. 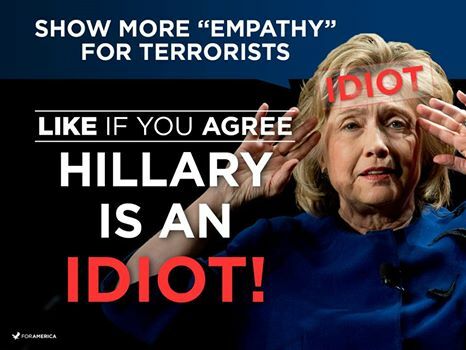 Where was this empty skirt, the Clown, when Benghazi Embassy was attacked? Remember the 3A.M commercial. Democratic presidential front-runner Hillary Clinton will propose new gun control measures, including a vow to employ executive action to expand background checks for firearms sellers at gun shows and online. Look, we like to say we are a people of immigrants, and that’s nice and that’s a fact of life. And I know of at least one ancestor in my family bloodline that came over on the Mayflower, an original settler. Note those people were Governed by England’s rule of law at the time. Having said that, people who try and ingratiate the minorities in this country, by saying that, is naive. We are living in 2015, not 1895. The time is now, not then. The past is the past. Btw we had immigration laws in place in 1895, and they worked just fine. That’s how we all came to be here. There are 2 movies out there today RED DAWN -1984 AND A REMAKE 2012, (the 2012 version is on Netflix) that every American should watch. Now this movie is about military invasions on American soil, from a foreign entity. What I see going on today in America – 2015, is an invasion of a different kind, an auspicious slow, subtle, almost surreptitious program to devalue American eroding our border’s, language and culture, the American way of life our Founders, God bless their souls, set fourth for us. Our Constitution does not stem from emotion, it stems from logical thought. Ok enough said, do your homework, open your eyes, especially you Jeb Bush, and I assume your wife came here legally. BTW I don’t think Trump was out of line pointing out you Jeb that you have a dog in the fight, in terms of your wife being Latino. Does anyone believe otherwise? A partial definition of a politician, is to curry favor. REALLY. Which is what he’s trying to do now with his multiculturalism angle. This game is played on both sides of the fence for at least the past 20 yrs. Now attempt to pander to the right, that you’ve seen the light and tell us what we want to hear. Meanwhile you don’t believe what ur saying right now, and if you should get into office, you’ll just kick start the amnesty plan again. Has anyone heard TRUMP change his position on illegal immigration? America is not a refugee camp, if I’m wrong, show me where that’s the case in the Constitution. We are a Republic, a system of Govt alleged to be lead by the American people. And quite frankly what we have here, is a system of Govt that is out of control, and as usual, and I’m old enough to say this, squashing our freedoms, leading us right down the hole to be just like most 3rd world country’s, dependent on Big Govt. This is a Govt issue now, that has gotten out of control, and the sheeple in this country are not in control, confused about there priorities. The American people depend on Govt to solve the problems, and rationalize this issue because they feel powerless! We are the fly in the jar, and the lid is off. WAKE UP AMERICA! What’s your verdict on these vehicles? 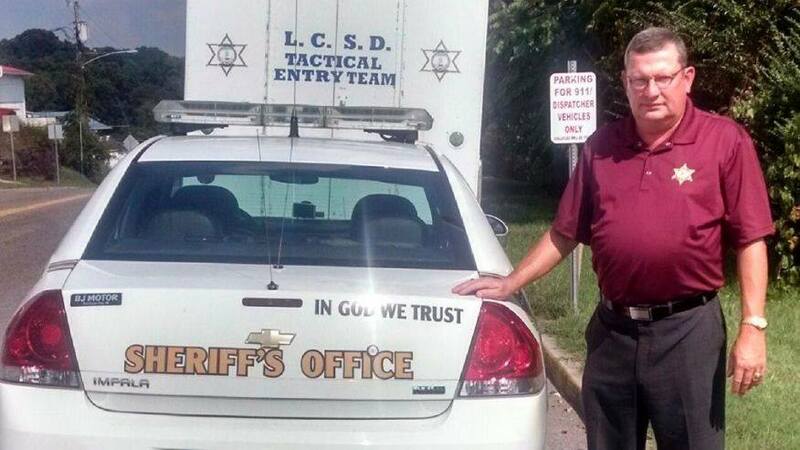 Police cars in Texas are showcasing “In God We Trust” decals – but now a national watchdog group says this is an unlawful endorsement of religion. What do you think? Should these decals be allowed to stay?? In God We Trust is on our currency, is that against the law? We R guaranteed Religious freedom under the constitution. We R a self governed people, the Govt works for us, we have the last say. Separation of church and state was intended to keep Govt at bay. SCOTUS is not upholding the Constitution. Congress was given the power by the people only to author law, not SCOTUS, and WE THE PEOPLE under the constitution control Congress.